#1　Nature. 1998 Jan 1;391(6662):96-9.　http://www.ncbi.nlm.nih.gov/pu…　Fig 1a. Lane 1 is similar to Lane 5. Lane 6 is similar to Lane 10. #2　J Biol Chem. 2000 Mar 17;275(11):8091-6.　http://www.ncbi.nlm.nih.gov/pu…　Fig 3A. Lane 3 is similar to Lane 8, 9, and 10. Fig 3B. Lane 1 is similar to Lane 2. #3　Arch Biochem Biophys. 2001 Apr 1;388(1):91-9.　http://www.ncbi.nlm.nih.gov/pu…　Fig 2A. Lanes 2-3 are similar to lanes 9-10. Fig 4B. Lanes 2-3 are similar to lanes 9-10. #4　Diabetes. 2002 Oct;51(10):2915-21.　http://www.ncbi.nlm.nih.gov/pu…　Fig 5. 18S of B is similar to that of C (horizontal flip). #5　Nat Med. 2002 Jul;8(7):731-7. Epub 2002 Jun 17.　http://www.ncbi.nlm.nih.gov/pu…　Fig 1b. +/- is partially similar to -/-. Fig 2. 18S of a is similar to that of b. Fig 5a. 28s of TNF-alpha(-) and Adiponectin(+) is similar to that of TNF-alpha(+) and Adiponectin(+). #6　J Biol Chem. 2003 Jun 13;278(24):21344-51. Epub 2003 Apr 1.　http://www.ncbi.nlm.nih.gov/pu…　Fig 5. Lane 2 is partially similar to lane3. #7　Mol Cell Biol. 1996 Jun;16(6):3074-84.　http://www.ncbi.nlm.nih.gov/pu…　Fig 7C. Lane a is similar to Lane b. #9　J Clin Invest. 2001 Oct;108(7):1001-13.　http://www.ncbi.nlm.nih.gov/pu…　Fig 6b. The CD36 band in the lane HF is similar to the UCP2 band in the lane HF+BADGE (horizontal flip). The CD36 band in the lane HF+BADGE is similar to the UCP2 band in the lane HF+HX531 (horizontal flip). #10　Nat Genet. 2002 Feb;30(2):221-6. Epub 2002 Jan 30.　http://www.ncbi.nlm.nih.gov/pu…　Fig 6. 28S in a (WAT) is similar to that of in d (BAT). #11　Biochem Biophys Res Commun. 2004 Oct 8;323(1):242-8.　http://www.ncbi.nlm.nih.gov/pu…　Fig 2A. The control lanes are similar to the salicylate lanes. Fig 3B. p-Akt in Lane 3 is similar to that in Lane 7. p-Akt in Lane 5 is similar to that in Lane 6. Akt in Lane 4 is similar to that in Lane 6. Fig 4. Lane 5 is similar to Lane 7 (horizontal flip). #12　J Biol Chem. 2001 Jul 20;276(29):27519-26. Epub 2001 May 24.　http://www.ncbi.nlm.nih.gov/pu…　Fig 6. E is similar to f.　Fig 9. D is similar to e and f (enlarge). #13　Exp Cell Res. 2002 Jan 1;272(1):23-31.　http://www.ncbi.nlm.nih.gov/pu…　Fig7. Bone marrow cells of LZP is similar to those of CRP. #15　Biochem Biophys Res Commun. 2002 Apr 26;293(1):332-7.　http://www.ncbi.nlm.nih.gov/pu…　Fig 1. The mice of 2 weeks are similar to those of 3 weeks (vertically enlarge). #16　J Virol. 1999 Nov;73(11):9237-46.　http://www.ncbi.nlm.nih.gov/pu…　Fig 5B. Some bands seem to be pasted in the figures. For example, lane 3 in the left SeV/mSF figure. #17　J Virol. 2000 Jun;74(12):5619-28.　http://www.ncbi.nlm.nih.gov/pu…　Fig 2A. In the upper figure, 4C(-) 20 is simiar to 4C(-) 26. Fig 2B. GAPDHs of Wt 14, Wt 38, 4C(-) 14, and 4C(-) 20 are similar. #18　J Virol. 2001 Apr;75(8):3802-10.　http://www.ncbi.nlm.nih.gov/pu…　Fig 4C. Y1+ is similar to Y2+. #19　J Virol. 2002 Jul;76(14):7114-24.　http://www.ncbi.nlm.nih.gov/pu…　Fig 4B. Y2.5+ is similar to Y3+. #20　J Virol. 2004 Jul;78(14):7443-54.　http://www.ncbi.nlm.nih.gov/pu…　Fig 5. STAT2 of None is similar to that of Cm5. #21　J Virol. 2007 Apr;81(7):3264-71. Epub 2007 Jan 10.　http://www.ncbi.nlm.nih.gov/pu…　Fig 4. In the most upper figure, Sev Wt 0 is similar to Sev Wt 6 in both 2fTGH STAT1(+/+) cells and U3A STAT1(-/-) cells. #22　Biochem Biophys Res Commun. 2002 Aug 9;296(1):194-200.　http://www.ncbi.nlm.nih.gov/pu…　Fig 3A. Lane 1 is similar to Lane2 for GluSyn. #23　Biochem Biophys Res Commun. 2001 Nov 30;289(2):531-8.　http://www.ncbi.nlm.nih.gov/pu…　Fig 1 and Fig 2. 18S rRNA of Lane 2 (monocytes) in Fig 1 is similar to that of Lane 2 (alpha-GalCer-imDCs) in Fig 2. #24　Circ Res. 2004 Jun 11;94(11):1492-9. Epub 2004 Apr 29.　http://www.ncbi.nlm.nih.gov/pu…　Fig 2 and Fig 3. E1A in the lanes 1-2 of Fig 2A is similar to that in the lanes 2-3 of Fig 3C. #25　J Biol Chem. 2002 Apr 5;277(14):12351-8. Epub 2002 Jan 22.　http://www.ncbi.nlm.nih.gov/pu…　Fig 1B. D is similar to g.　Fig 3B. The right part of Myc-MST1 WT is similar to that of Flag-MST1 444P. #26　J Biol Chem. 1999 Apr 23;274(17):11995-2000.　http://www.ncbi.nlm.nih.gov/pu…　Fig 4. EDTA is similar to Fuc. #27　J Biol Chem. 2000 Jun 9;275(23):17233-6.　http://www.ncbi.nlm.nih.gov/pu…　Fig 2B. Input of 0-45 is similar to that of 90-180. Fig 4. ECT2-N1(-) 45 is simialr to ECT2-N1(+) 45. #28　J Biol Chem. 2002 Dec 27;277(52):50966-72. Epub 2002 Oct 21.　http://www.ncbi.nlm.nih.gov/pu…　Fig 2B and Fig 4C. The actin in Fig 2B is similar to that of Fig 4C (horizontally flip.) Fig 4C and Fig 5D. The six COX bands in Fig 5D is similar to six bands of actin in Fig 4C. #29　J Biol Chem. 2001 Mar 23;276(12):9460-7. Epub 2000 Dec 19.　http://www.ncbi.nlm.nih.gov/pu…　Fig 1B. In the lower figure, RET-2B is similar to RET-2B/LAR. #30　J Biol Chem. 1999 Dec 31;274(53):38251-9.　http://www.ncbi.nlm.nih.gov/pu…　Fig 2A. 37 degrees Celsius is partially similar to 30 degrees Celsius. #32　DNA Repair (Amst). 2007 Jun 1;6(6):760-9. Epub 2007 Feb 5.　http://www.ncbi.nlm.nih.gov/pu…　Fig 5A. GAPDH of W in 5 weeks is similar to that of SP in 16 weeks. #33　J Biol Chem. 2000 Aug 18;275(33):25146-54.　http://www.ncbi.nlm.nih.gov/pu…　Fig 6D. pMAPK of S10A is similar to that of WT-DMSO (horizontally flip). You can pay attention to the noise of the rim. #34　J Biol Chem. 2002 Apr 26;277(17):14355-8. Epub 2002 Mar 11.
http://www.ncbi.nlm.nih.gov/pu…　Fig 1B. Tubulin in cytoplasm is similar to that in whole cell. #35　EMBO J. 2002 Dec 2;21(23):6312-20.　http://www.ncbi.nlm.nih.gov/pu…　Fig 2C. p47phox is similar to p67phox. #36　J Biol Chem. 2003 Jul 4;278(27):25234-46. Epub 2003 Apr 25.　http://www.ncbi.nlm.nih.gov/pu…　Fig 3A. The two lower left cells are similar between wt and P156Q. #37　J Biol Chem. 2003 Jun 20;278(25):22908-17. Epub 2003 Apr 7. http://www.ncbi.nlm.nih.gov/pu…　Fig 2. MRP11-116/MRP2 is similar to MRP11-1480/MRP2. #38　J Virol. 1999 Oct;73(10):7981-7.　http://www.ncbi.nlm.nih.gov/pu…　Fig 1A. Lane 1 is similar to Lane 3 and 6. Lane 2 is similar to Lane 8. Lane 4 is similar to Lane 7. #39　J Biol Chem. 2002 Jan 18;277(3):2132-7. Epub 2001 Oct 22.　http://www.ncbi.nlm.nih.gov/pu…　Fig 2b. The FLAG band of GST-WT is similar to the GST band of WT-WT. Fig 3A. The left upper figure is similar to the left lower figure (horizontally flip). #40　J Biol Chem. 2004 Jun 11;279(24):25474-82. Epub 2004 Mar 22.　http://www.ncbi.nlm.nih.gov/pu…　Fig 5A. Lanes 8-9 are similar to lanes 12-13. #41　Diabetes. 2003 Nov;52(11):2657-65.　http://www.ncbi.nlm.nih.gov/pu…　Fig 3B. APS bands in GFP lanes seem to be pasted in. IR beta bands in GFP lanes are similar to those in APS(YF) lanes. #42　J Biol Chem. 1999 Nov 5;274(45):32309-17.　http://www.ncbi.nlm.nih.gov/pu…　Fig 4A. Lane 1 is similar to Lane 15 (horizontally flip). Lanes 12-13 are similar to Lane 16-17 (horizontally flip). #43　J Biol Chem. 2000 Sep 1;275(35):26856-63.　http://www.ncbi.nlm.nih.gov/pu…　Fig 9C. Mock-transfected cell (-) is somewhat similar to Mutant probe (-). Mock-transfected cell oligo TRE is somewhat similar to Mutant probe Ang II. #44　J Biol Chem. 2000 Feb 11;275(6):4369-73.　http://www.ncbi.nlm.nih.gov/pu…　Fig 3. GAPDHs of Time 4, 5, and 6 are similar in PAO+. Fig 4. iNOS mRNA of Lane +-+- is similar to that of Lane +–+. #45　Hepatology. 2000 Nov;32(5):1037-44.　http://www.ncbi.nlm.nih.gov/pu…　Fig 3. 3h None is similar to 5h Hypo. #46　J Hepatol. 2004 Apr;40(4):616-23.　http://www.ncbi.nlm.nih.gov/pu…　Fig 4A. Phospho-Akt of 2h(-) is similar to that of 2h(+). Fig 5A. In the adiponectin bands, Lanes 1-4 are similar to lanes 12-15. Lanes 6-7 are similar to lanes 9-10. #48　Biochem Biophys Res Commun. 2001 Apr 27;283(1):255-9.　http://www.ncbi.nlm.nih.gov/pu…　Fig 2. V/Vsp in lanes 1-3 is similar to V/Vsp in lanes 7-9, STAT1 in lanes 10-12, and STAT1 in lanes 13-15. IRF9 in lanes 10-12 are similar to that in lanes 13-15. #49　J Virol. 2002 Dec;76(24):12683-90.　http://www.ncbi.nlm.nih.gov/pu…　Fig 8. In the Blot:FLAG, FL is similar to FLMT in the two middle lanes (vertically enlarge). #51　J Med Virol. 2006 Apr;78(4):417-24.　http://www.ncbi.nlm.nih.gov/pu…　Fig 2. GAPDH of RSV 5 is similar to that of inactivated SARS 1. GAPDH of FluAV 1 is similar to that of inactivated SARS 2. Fig 5. GAPDH of RSV 5 is similar to that of inactivated SARS 1. GAPDH of FluAV 1 is similar to that of inactivated SARS 2. #52　Cancer Lett. 1999 Jul 19;142(1):23-30.　http://www.ncbi.nlm.nih.gov/pu…　Fig 2B. hTERT of lane D is similar to that of lane F2. #53　Leukemia. 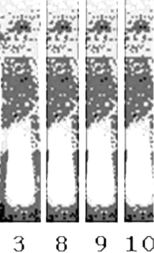 2000 Jul;14(7):1260-5.　http://www.ncbi.nlm.nih.gov/pu…　Fig 1b and 3b. hTERT of Fig 1b is similar to that of Fig 3b (horizontally flip). #54　Biochem Biophys Res Commun. 2004 Apr 2;316(2):528-32.　http://www.ncbi.nlm.nih.gov/pu…　Fig 1. 15 N is partially similar to 30 N.
#55　Cancer Lett. 2008 Mar 18;261(2):226-34. Epub 2007 Dec 21.　http://www.ncbi.nlm.nih.gov/pu…　Fig 1. K562/hTERT 1 is similar to K562/hTERT 10. #56　Cancer Res. 2006 Oct 15;66(20):9913-20.　http://www.ncbi.nlm.nih.gov/pu…　Fig 4C. ADAM28 of Day3 is similar to that of Day 31 (vertically enlarge). Fig 5C. Lane 1 is similar to Lane 4. #57　Biochem Biophys Res Commun. 2005 Mar 25;328(4):1232-43.　http://www.ncbi.nlm.nih.gov/pu…　Fig 2. Two exon 3 figures are similar. #58　Biochem Biophys Res Commun. 2000 Aug 11;274(3):603-8.　http://www.ncbi.nlm.nih.gov/pu…　Fig 5. Two right lower bands in Fig 5A are similar to two left lower bands in Fig 5B. #59　Biochem Biophys Res Commun. 2001 May 11;283(3):707-14.　http://www.ncbi.nlm.nih.gov/pu…　Fig 3C. In the lower figure, the left four bands are similar to the middle four bands and the right four bands. #60　Nat Cell Biol. 1999 Dec;1(8):479-85.　http://www.ncbi.nlm.nih.gov/pu…　Fig 4a. Western(PS) of A246E is partially similar to that of delta E9. #61　J Biol Chem. 2001 Jan 19;276(3):2108-14. Epub 2000 Oct 12.　http://www.ncbi.nlm.nih.gov/pu…　Fig 1. Lanes N and H in Fig 1C are similar to Fig 1D. #62　J Biol Chem. 2001 Nov 16;276(46):43446-54. Epub 2001 Sep 10.　http://www.ncbi.nlm.nih.gov/pu…　Fig 1a and Fig 2a. Ten actin bands of Fig 1a are similar to those of Fig 2a. #63　J Biol Chem. 2002 Apr 12;277(15):12931-6. Epub 2002 Jan 25.　http://www.ncbi.nlm.nih.gov/pu…　Fig 3b. PY20 of Src is similar to Lysate of Src. #64　Circulation. 2002 Jun 18;105(24):2893-8.　http://www.ncbi.nlm.nih.gov/pu…　Fig 2. ERK of Fig 2C is similar to that of Fig 2D (horizontally flip, change brightness and contrast). #65　J Biol Chem. 2002 Mar 8;277(10):8076-82. Epub 2002 Jan 4.　http://www.ncbi.nlm.nih.gov/pu…　Fig 3. Cyclin D1 and actin of 694F are somewhat different with those of delta p85. #66　J Biol Chem. 2005 Feb 11;280(6):4929-39. Epub 2004 Nov 24.　http://www.ncbi.nlm.nih.gov/pu…　Fig 2A. Bcl-2 and actin of ED(-) are similar to those of ED(+). #67　J Biol Chem. 2005 Apr 1;280(13):13163-70. Epub 2005 Jan 25.　http://www.ncbi.nlm.nih.gov/pu…　Fig 5E. The left four lanes of CHO-B are similar to the right four lanes of CHO-B. #68　J Biol Chem. 2001 Mar 30;276(13):9688-98. Epub 2000 Dec 14.　http://www.ncbi.nlm.nih.gov/pu…　Fig 2C. Lane +— is similar to Lane +-+-. Fig 5B. Lane 1 is similar to Lane 3. #69　J Biol Chem. 2001 Dec 14;276(50):47642-9. Epub 2001 Oct 10.　http://www.ncbi.nlm.nih.gov/pu…　Fig 1B. Lane 2 is similar to Lane 4 (horizontally flip). Fig 5A. ERKs of lanes 1-4 are similar to those of lanes 5-8 (horizontally flip). Fig 7A. The upper two bands of pSG5 are similar to those of ER beta (horizontally flip). #70　J Biol Chem. 2001 Feb 2;276(5):3459-67. Epub 2000 Oct 23.　http://www.ncbi.nlm.nih.gov/pu…　Fig 7B. pSG5 is similar to ER beta (horizontally flip). #71　J Biol Chem. 2002 Sep 6;277(36):33490-500. Epub 2002 Jun 26.　http://www.ncbi.nlm.nih.gov/pu…　Fig 1B. ERKs of lanes 1-3 are similar to those of lanes 4-6. Fig 3A. Lanes 1-2 of Caov-3 are similar to lanes 3-4 of Caov-3 (horizontally flip). Fig 4A. Lanes 1-2 of BAD are similar to lanes 3-4 of BAD. Fig 6B. Phospho-Raf of Lane 2 is similar to that of Lane 5. #72　Endocrinology. 2004 Jan;145(1):49-58. Epub 2003 Sep 18.　http://www.ncbi.nlm.nih.gov/pu…　Fig 3B. Akt of lanes 1-2 is similar to that of lanes 3-4. #73　Clin Cancer Res. 2004 Nov 15;10(22):7645-54.　http://www.ncbi.nlm.nih.gov/pu…　Fig 1D. Akt of lanes 1-2 is similar to that of lanes 3-4. #74　Endocrinology. 2004 Mar;145(3):1302-13. Epub 2003 Nov 26.　http://www.ncbi.nlm.nih.gov/pu…　Fig 8B. Lane 1 of A2780 is similar to Lane 3 of Caov-3. #75　J Biol Chem. 2004 May 28;279(22):23477-85. Epub 2004 Mar 16.　http://www.ncbi.nlm.nih.gov/pu…　Fig 2A. Lanes 2-4 of actin are similar to lanes 6-8 of actin (horizontally flip). #76　J Biol Chem. 2000 Nov 10;275(45):35051-62.
http://www.ncbi.nlm.nih.gov/pu…　Fig 7C. Lanes i, j and k of abDbf4p are somewhat similar. #77　Proc Natl Acad Sci U S A. 2000 Dec 5;97(25):13824-9.　http://www.ncbi.nlm.nih.gov/pu…　Fig 4A. The most upper figure of insulin is similar to that of IGF-1. #78　J Biol Chem. 1999 Mar 26;274(13):8531-8.　http://www.ncbi.nlm.nih.gov/pu…　Fig 5C. In the Ad5IkB lane, Bcl-2 is similar to Bcl-x (horizontally flip and vertically enlarge). In the Ad5LacZ+TNF lane, Bcl-2 is partially similar to Bcl-x (vertically enlarge). #79　FASEB J. 2001 May;15(7):1218-20.　http://www.ncbi.nlm.nih.gov/pu…　Fig 1A. Akt of Cont is similar to that of VEGF. #81　J Biol Chem. 2003 Jan 17;278(3):2058-65. Epub 2002 Nov 7.　http://www.ncbi.nlm.nih.gov/pu…　Fig 2. wt is similar to delta alpha 1. #82　J Biol Chem. 2001 Sep 7;276(36):34259-69. Epub 2001 Jul 2.　http://www.ncbi.nlm.nih.gov/pu…　Fig 7. SRE-352 is similar to SRE-344 (vertically enlarge). #83　J Biol Chem. 2005 Mar 18;280(11):10468-77. Epub 2005 Jan 7.　http://www.ncbi.nlm.nih.gov/pu…　Fig 5B. IB:anti-V5 of STAM1 is similar to that of STAM1-mUIM. #84　Cancer Res. 2007 Jun 1;67(11):5162-71.　http://www.ncbi.nlm.nih.gov/pu…　Fig 2A. The well of WT is similar to that of control.